It's nearly impossible to calculate the true cost of our clothing in real economic terms, let alone human. Most of us are so far removed from the arduous process of how our clothes are made in factories, let alone reminded of the fact every morning that bent and calloused human hands working 12-hour shifts probably made the underwear we're slipping onto our bodies. For Minnesota artists Rachel Breen and Alison Morse, the disconnection to the real cost of fast fashion, and the continued struggle for garment workers' rights, compensation, and self-empowerment, struck a deeply embedded, familiar chord in them, drawing the two to journey to Dhaka, Bangladesh, in February. The artists went to collect the stories of garment workers and suvivors of the Rana Plaza garment factory collapse, which they have documented on their blog, The Price of Our Clothes. "As Jewish women, we felt like we had a connection to this tragedy, and we wanted to seek out and make these connections to the Triangle Shirtwaist fire that led to a lot of reforms in workplace safety here in the U.S.," says Breen, a visual artist whose pieces often incorprate drawing, painting, and sewn paper. The Triangle Shirtwaist Factory fire in New York, more than 104 years ago, killed 146 garment workers, most of whom were young Jewish and Italian immigrants between the ages of 16 and 23. Exits were blocked or non-existent, because factory owners didn't want workers to take breaks and stop producing. "My interest in all of this was really personal," says Morse, a Minneapolis writer and poet. "When my grandmother and her three sisters first came to New York, from what is now Belarus, in the first part of the 20th century, they worked in the garment industry." While Morse's great aunts worked long shifts on the sewing machines, her grandmother, a graduate of 7th grade, was considered the most skilled and educated. She was awarded a job as a bookkeeper in a woolen factory. 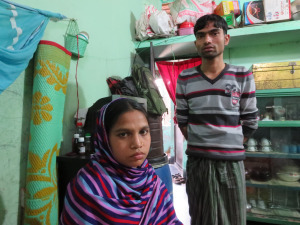 This past Friday, April 24, marked the two-year anniversary of the Rana Plaza garment factory collapse in Bangladesh, where more than 1,100 people were killed, mostly young women, and more than twice as many injured. Bangladesh is second to China in its exports of cheap, readymade clothing, which accounts for 78 percent of the country's exports. Breen and Morse want to connect the two factory tragedies in an upcoming collaborative exhibit, in an effort to prompt consumers and companies to begin thinking about how they can impact change in the world's workplaces. Today, around four million people are employed in Bangladesh's nearly 3,500 factories, according to the Guardian. And to date, many are still working in deplorable conditions with little pay. The average garment factory worker makes about $68 a month, more than they could make in rural agriculture but not nearly a "living" wage. The women come from different backgrounds, have different lives, have different struggles. But they all echo each other with the same sentiment: "Please don't stop buying clothes from Bangladesh. Because we need these jobs." That was eye-opening for Breen and Morse, who say their story-gathering so far has helped to shed light on the complicated issues of "fast fashion", including how the work is important to millions of people who might otherwise be facing starvation in poverty-stricken countries. "When the women tell you, 'Please don't boycott us. Please buy what we make,' that puts an interesting and complex twist on it," says Breen. "So what do we as consumers do about the issues with it? The multinational corporations, the H&Ms and Targets and Walmarts, they are so big. How do you do anything that they can feel?" Both Breen and Morse hope to explore that complex relationship in their collaborative exhibit, which will come at the end of their research project, and will be dedicated to storytelling and visual imagery. "I want to do the artwork to draw attention to the issue," says Breen. "I don't want to make it about me making something. I want it to be an act of solidarity, a way to connect. A very reciprocal kind of thing." Morse concurs. "This question of how we help as American consumers, how can we relate and help these workers, is really important to me," she says. "By bringing these women into this exhibit and my writing, to hear their voices, to really understand them, but in a way that doesn't say, 'Oh, I feel so sorry for them.' To really understand that it isn't about us, it's about them. That is our job."